Merely two months ago, the press (especially) and investors were hyperventilating about “the worst start to a year” in decades. The S&P 500 and the MSCI World were down double-digits at one point in Q1. A furious rally over the back half of the first quarter, amazingly, carried global equity indices back to even to positive territory in most cases. On the road yesterday, we received a lovely cell phone notification from one of the leading business news providers indicating that the recent market reversal represented one of the bigger quarterly reversals in market history. This got our wheels spinning. First, was this accurate? And, second, what have large intra-quarter upward reversals meant for future returns historically? We examined data for every quarter going back to Q1, 1930 and calculated the percentage difference between each quarter’s closing price and the intra-quarter low. To answer the first question, this was a reasonably unique quarter in terms of reversal magnitude. The S&P 500 closed 12.61% above the intra-quarter low, the 39th largest intra-quarter upward reversal close out of 345 quarterly data points. Also of note: Q1, 2016 represented the largest quarterly upward reversal since Q4, 2011 when markets rallied nearly 15% off intra-quarter lows as fears surrounding the European sovereign debt crisis subsided. The top 50 reversals are listed below. If you think volatility has been bad of late, check out some of the reversal numbers below from the Great Depression era! 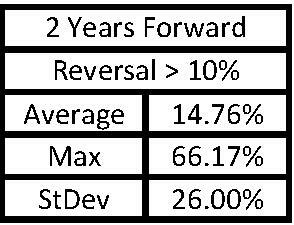 In regard to the second question, we looked at one-year, 18-month, and two-year forward performance for quarters demonstrating 10%+ upside reversal figures to see if there was a statistically significant difference between those forward returns and historical returns. A quick spoiler: there were slight differences, but none were statistically different using a statistical difference of means test. 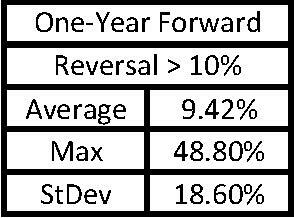 Here is the forward performance data for those quarters showing 10%+ reversals. There were 83 quarterly periods with 10%+ reversals. 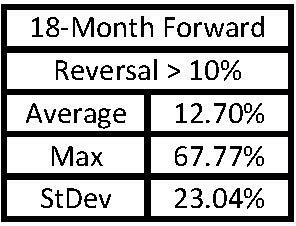 As you can see above, 1-year and 18-month forward performance figures show a higher average than the overall historical record, while the 2-year forward figure is lower. As mentioned above, however, these averages for the reversal periods aren’t close to being statistically distinguishable from the averages for the overall historical record. So, what can we can conclude after playing with all of this data? There are three things that quickly come to mind. First, the reversal equity markets experienced during the first quarter was somewhat unique, coming in approximately one standard deviation above normal. Second, large reversals, on average, don’t seem to lead to any unique performance deviations going forward relative to historical performance figures. Finally, we were surprised how many quarters showed 10%+ upward reversals. Nearly 25% of the market quarters since 1930 experienced these sorts of moves. We can take a few simple lessons from this final point. If you’re going to be involved in stock market investing, you need to be able to tune out intra-day, intra-quarter, and intra-year volatility. Markets move around much more than people realize. Likewise, it’s beneficial to tune out the constant doomsday noise from the many media and social network sources we’ve all tuned into in recent years. On average, the closing price for a quarter is 7.4% above the intra-quarter low. The negative information sensory assault on the average investor can certainly induce poor, portfolio performance killing timing decisions.